Decor DecorationTropical beach scene packed in a low primed item to provide the most realistic and natural look. 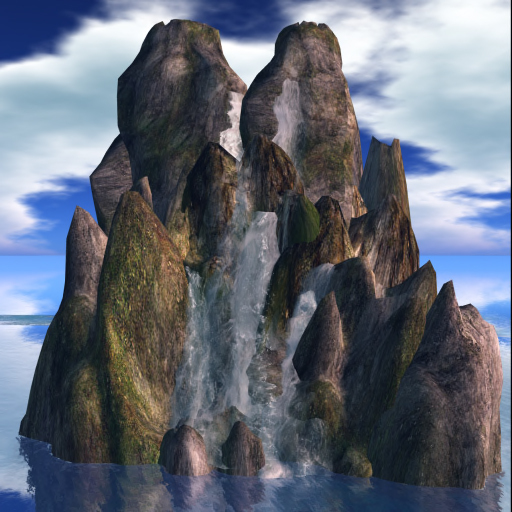 The waterfalls and its accompanying coconut trees and rocks are recreated faithfully in awesome reality, packed in three dimensional without the intrusion of bubbling, rendered expertly for our beloved clients. Free for all ACS tenants! Not yet our tenant? be one now! 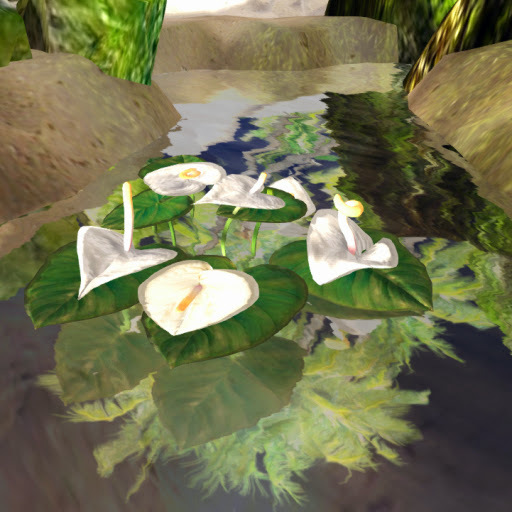 Flower DecorationYou can decorate water surfaces with our items sculpted to perfection! 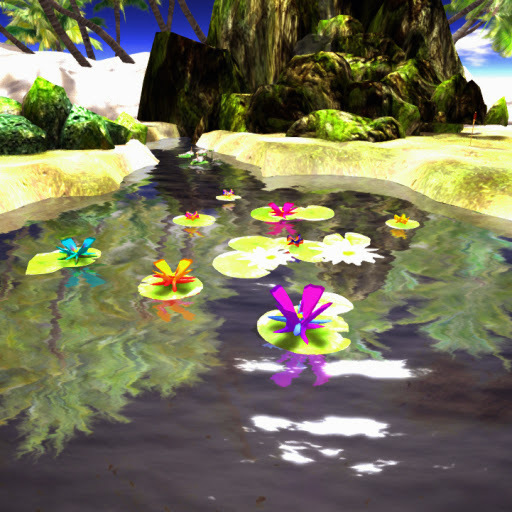 Scripted Lily pads and flowers in light green to yellow green color floating in a pool of water. Decorating the Lily pads are different type of flowers in carnation pink, purple, yellow and orange colors, as the pads slowly moves in clockwise direction. Flower DecorationIf floating lily pads is dull, then try this Lily pads in dark green colors ornamented with white anthuriums in cream white spikelets. Designed to provide the most realistic and natural landscape in a few prims to bring life, the item is available FREE OF CHARGE to all our beloved residents of Anshe Chung Sims and partner estates. Decor DecorationFill your estate's sky with a touch of the healthy golden rays of the sun! Authentically rendered sun's golden rays touching the earth in a spotlight-like beams. 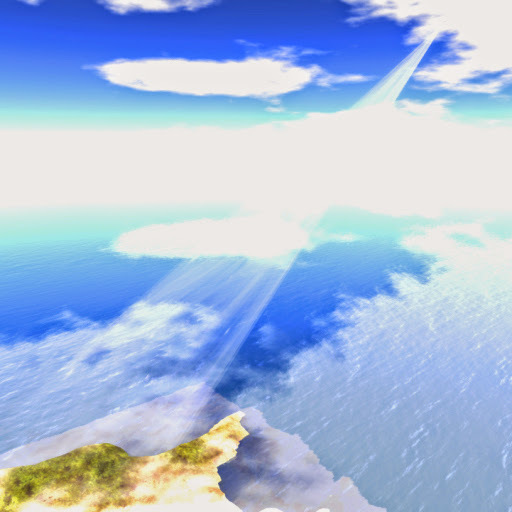 It also constantly shifts, imitating how the sun's rays usually behaves. An excellent item for forest themes especially if you use trees with thick canopy. Decor DecorationLet this sunshine make your estate bright and happy! 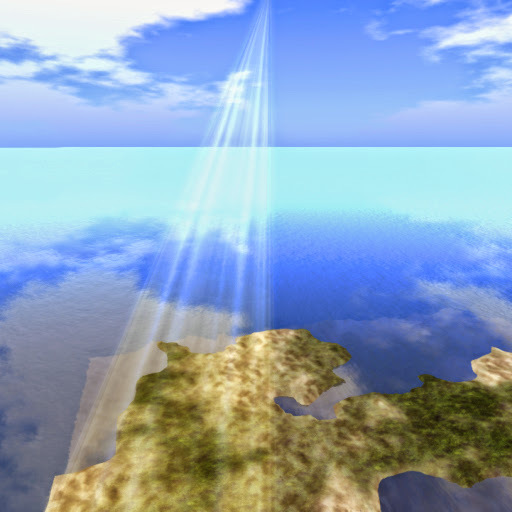 Item depicting concentrated beam of light with shimmering strands, Designed to provide the most realistic and natural landscape in just a few prims to bring life, diversity and beauty to your lands. The beams also constantly moves in random, especially if added as an item in trees with thick canopy. Decor DecorationThroughout the ages, the sun has facinated people, even worshipped it! 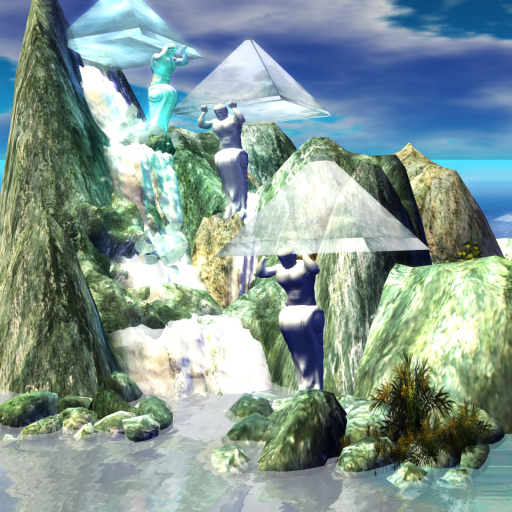 Now in Second Life, come and experience why they come to adore this mighty star, all rendered in three dimensional wonder! Featuring the Sun's sparkling beams kissing and caressing the earth with golden rays. This item complements beach or forest themes perfectly. Decor DecorationDesigned to bring the genuine worldly experience in Second Life, ACS created this sunshine to warm every shoulder in your estate! Designed to provide the most realistic and natural landscape in a few prims to bring life, diversity and beauty to your lands, here is a model sculpt of sunlight concentrating its steadily shifting beams of golden light like a large spotlight. Constantly shifting to provide diversity, this item is for free for all ACS tenants. Decor DecorationCoral reef formation is an important part in an island making process, especially in the oceans. 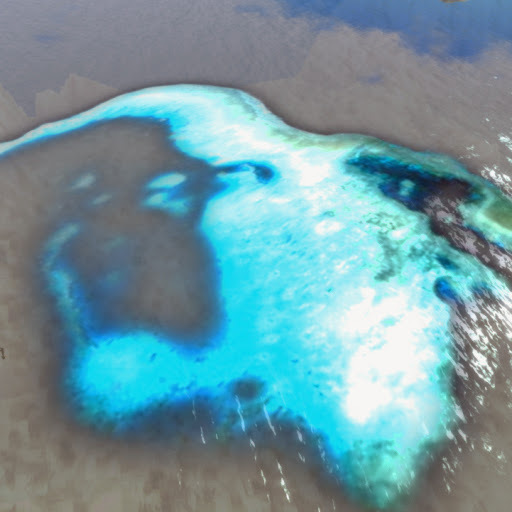 Still, its beauty is undeniable like this island formed by the coral reef. 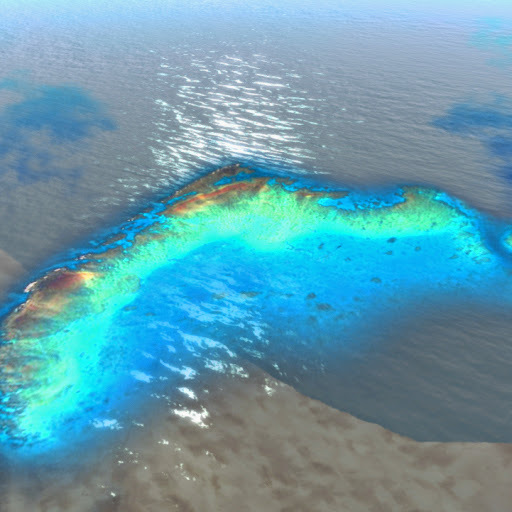 At the far back is a sandbar, composed of white sands while at the left most side is a coral reef submerged and in emerald green color. 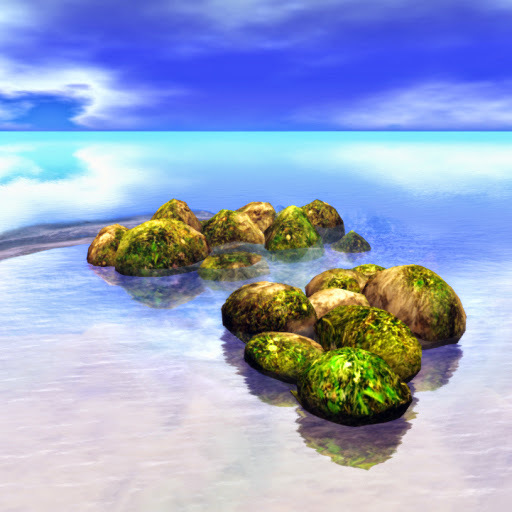 Decor DecorationRezz and see its scenic beauty, deftly achieved in low prims! Coral reef formation in a worm-like appearance, toying with the colors of metallic brown to turquoise and green, without the intrusion of bubbling molded to simulate its real-life counterparts, without the intrusion of bubbling. Free for ACS tenants! 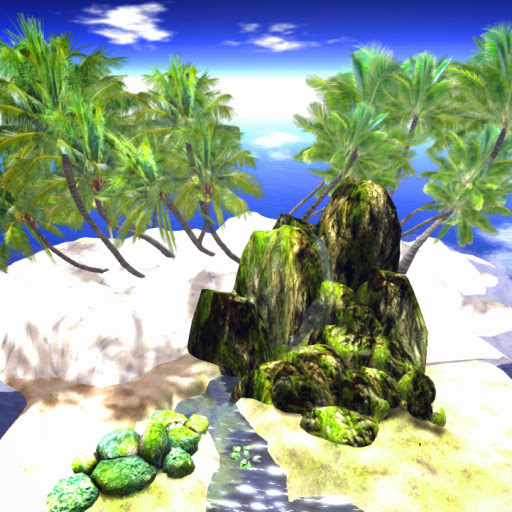 Decor DecorationParadise in a single rezzer box, just a rezz away! 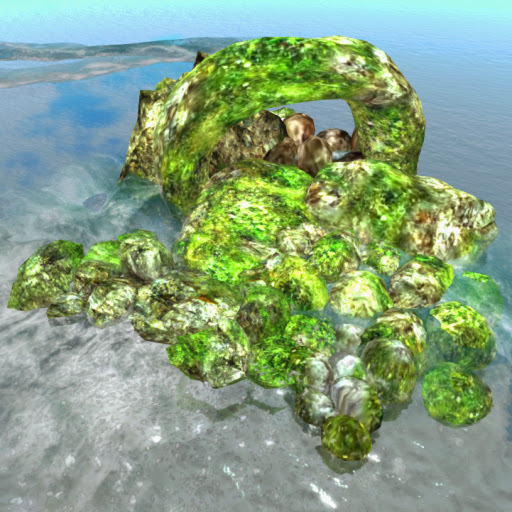 Designed to provide the most realistic item, our item consists of brown rocks with dark green moss covering dominated by a donut-shaped rock formation. Blue waves constantly batter the rocks adding an authentic feel. 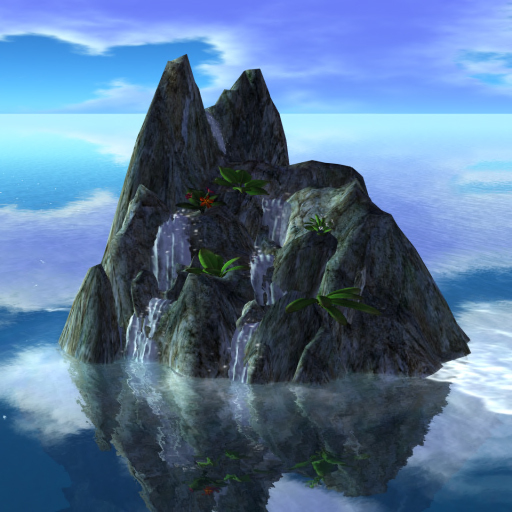 Outside sim made especially for beach themes so that they achieve a paradise look. Decor DecorationBring the pleasure and paradise look in your very own land! 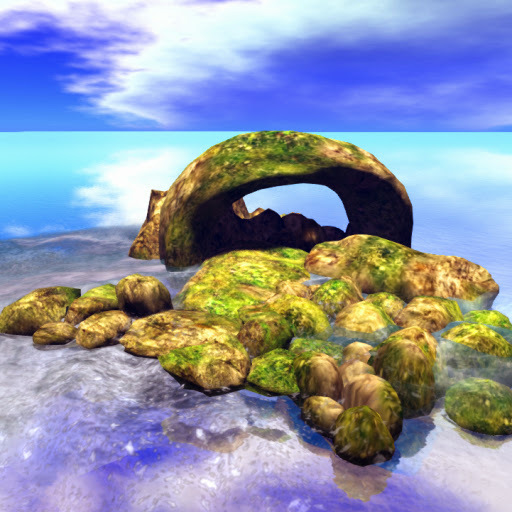 Try and rezz our item portraying several round-shaped sandstone rocks with some completely covered in moss. Gentle waves washes this two distinct groups of rocks. 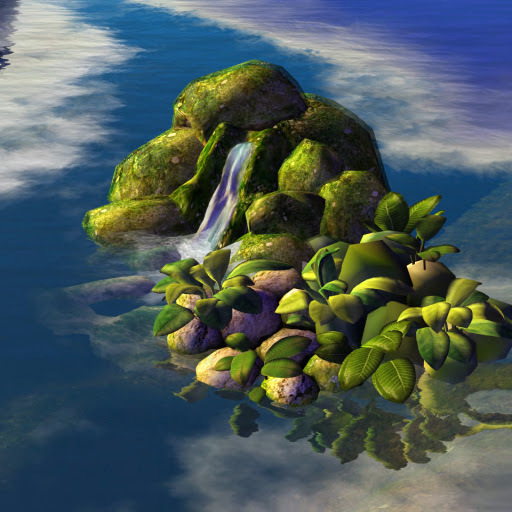 Enjoy the bliss of island living and rezz this astonishing paradise sim, complete with waves for that unforgettable experience. Who says you can't own a sailboat in SL? Here's your chance to own one for free! 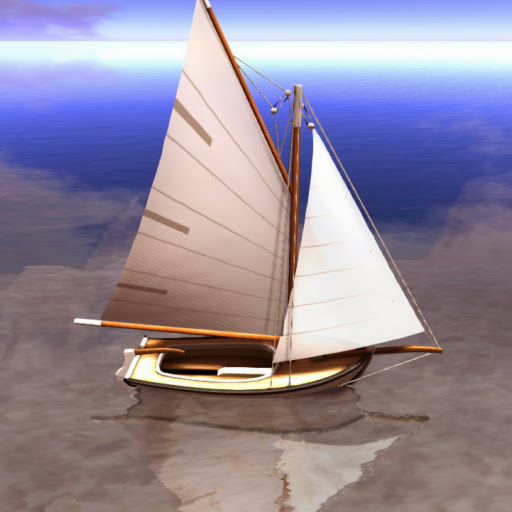 Take and rezz this two -rigged sailboat in classic wooden frame design and white paint in the underside. 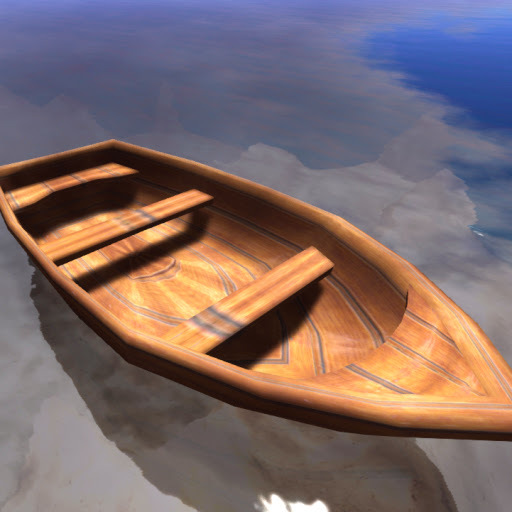 Built for a single passenger only, designed to provide the most realistic and natural landscape in a few prims to bring life, diversity and beauty to your lands. Exclusive item available FREE OF CHARGE to all our beloved residents of Anshe Chung Sims and partner estates. 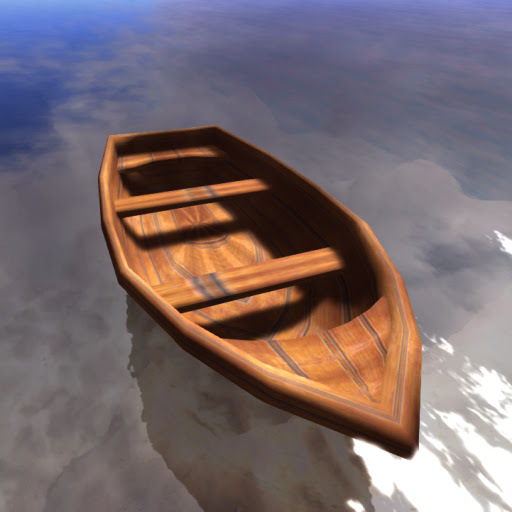 Explore your lakes and seas with this small sturdy brown wooden boat with four braces and a flat bottom built for your boating pleasure! With your loved ones, friends or alone, paddle into the clear waters on a boat in detailed mesh sculpts without the intrusion of bubbling. Rocks FlowerA simple waterfalls is not enough to decorate your estate. Rocks and a few plants will give you additional natural look, like what we offer here! We created a small bed of rocks of different sizes decorated with several ornamental plants, some placed near a pool of torqouise water formed from a small waterfalls. Scary RocksRelive the adventures in Treasure island and built your own pirate island! Created in realistic three dimensional feel without the intrusion of "bubbling" from sculpts! 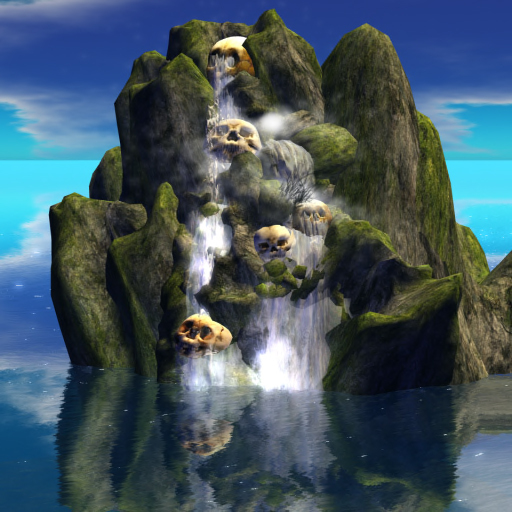 Don't forget to include this large waterfalls with huge skull sculptures fused within the rocks where the water flows. RocksTowering falls set on a mountain top! Lone mountain peak where a small stream of water flows out of the crest of the rock, forming waterfalls as it flows down its slopes. Along the edges of the water are ornamental plants, as its crystaline water form waves made by the flowing water. RocksEver dreamed of owning waterfalls but lack space? This miniature waterfalls answers that querry as this item is small enough to fit your backyard. Just ad a few ornamental and its good to go! 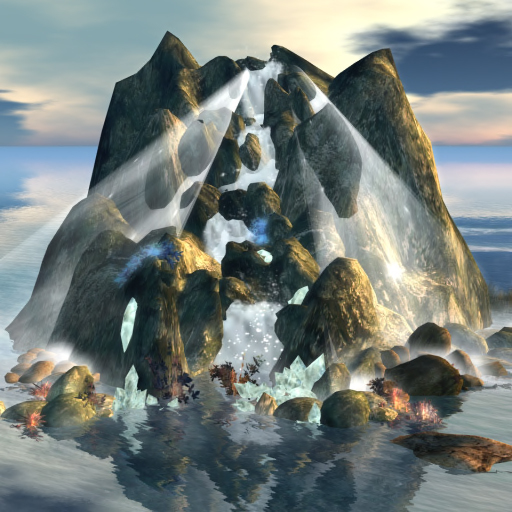 RocksWaterfalls are known to have a calming effect to those who see its relaxing beauty. This falls is decorated with crystal statues carrying crystal pyramids, as a medium-sized waterfalls flows down the jagged rock formations, adorned with various plant life. The falls culminates in a blue pool of water.Perfect item to the path of nirvana. RocksEarthen rock protruding out of a pristine pool of blue and green water, as a column of water bursts out of the peak, creating a spectacular body of water, coupled with ornamental plants all throughout the rock formation. 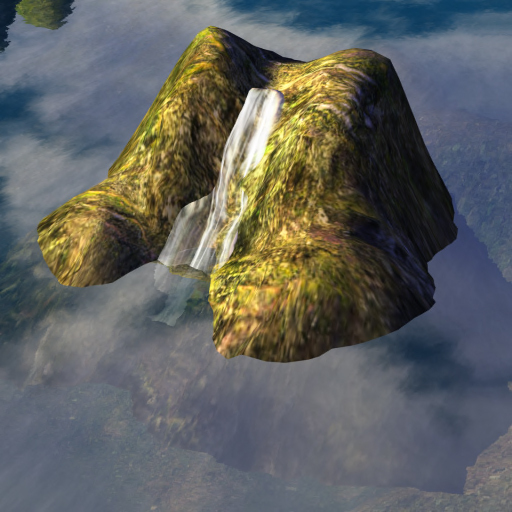 RocksIf you want a large waterfalls, whether for meditation or for added tropical feel, this towering rock with multiple waterfalls is worth to have! Created in realistic three dimensional feel without the intrusion of "bubbling" from sculpts, this work is first rate and offered free for ACS tenants.